The Image Analysis window provides a set of tools for image mensuration, including tools to measure point, distance, angle, height, perimeter, and area from an image (raster dataset or mosaic dataset) with sensor information (or geodata transformation). Any georeferenced raster dataset can provide distance, area, point, and centroid locations. Height measurements can be obtained when a sensor model exists. Sun angle information is required to make measurements using the shadows. A DEM is required if making measurements in 3D. The Area tool calculates the size and perimeter of an area. When Measure in 3D is checked, it will use the DEM to refine the calculation. The Point Location tool measures the location of a point. The Centroid Location tool calculates the centroid location of an area. When Measure in 3D is checked, it will use the DEM to refine the calculation. The Base To Top Height tool calculates the height of a structure by measuring from the base of the structure to the top of the structure. Measurements are assumed to be perpendicular to the base; therefore, the building is not built at an angle. The line being measured along the building must have its end point be directly above the start point. When Measure in 3D is checked, it will use the DEM to refine the calculation. The Top To Shadow Height tool calculates the height of a structure by measuring from the top of the structure to the top of the structure's shadow on the ground. The points on the structure and its shadow must represent the same point. When Measure in 3D is checked, it will use the DEM to refine the calculation. This tool is useful for obtaining the height of an object on the top of a structure, for example, if there was a smaller room than the dimensions of the building or a tower on the top. You can identify the top point of this feature in the image and identify the same point in the shadow. The Base To Shadow Height tool calculates the height of a structure by measuring from the base of the structure to the top of the structure's shadow on the ground. The point in the shadow must represent a point on the structure that is perpendicular to the base. When Measure in 3D is checked, it will use the DEM to refine the calculation. By selecting a DEM in the Image Analysis window, along with the layer from which you're measuring height, the height values can be improved. However, the impact of the DEM on the height measurement can be negative if the DEM is not very accurate. 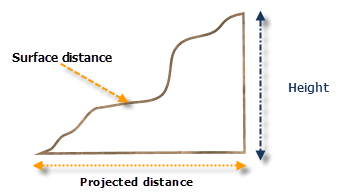 The Measure in 3D option modifies the distance measurement, using a selected DEM, to provide a distance measurement that is measured along the surface; otherwise, the distance provided is a projected distance, measured only using the information in the image. This option only applies to the tools if a DEM is present. The Mensuration Results window will open the first time you make a measurement. Or you can open it from the Image Analysis window by clicking the Mensuration Results button . This is a dockable window. To change the units of measure, click the Display Unit button in the Mensuration Results window. Click a measurement in the Mensuration Results window and it will be displayed in the display view. You can use the Ctrl or Shift keys on the keyboard to select more than one result. The lines or points will be displayed using the defaults set in the Image Analysis Options dialog box. To access this, click the Options button on the top of the Image Analysis window and click the Mensuration tab. By clicking the Enable/Disable Labels button , the measurement information will be displayed next to the line or point when displaying them. When using NITF data, you can view the information about the sensor by clicking the Sensor Metadata button . Each measurement is displayed in the Mensuration Results window and can be saved to a feature class. In the window, click the Save button to save your log of measurements. If you previously saved measurements and you want them opened in the Mensuration Results window, click the Load button and browse to the location where they are saved. Below is a table describing the mensuration capabilities of a raster product in ArcGIS or the data added to a mosaic dataset using a raster type. Raster products or raster types have more capabilities since they can have information stored in their metadata that allows the application to derive the height information from them. If the original geotransformation has been altered in the image, the Base To Top and Using Top To Top height measurements may become disabled.